Sometimes, our use of PHP grows beyond the typical request/response cycle of dynamic page generation. Unfortunately, the threaded nature of PHP – and the stateless nature of the server – betrays any efforts to expand our utilization of the server. I will walk attendees through various evolutions of a specific application from synchronous execution of loops through asynchronous execution with threading in PHP. 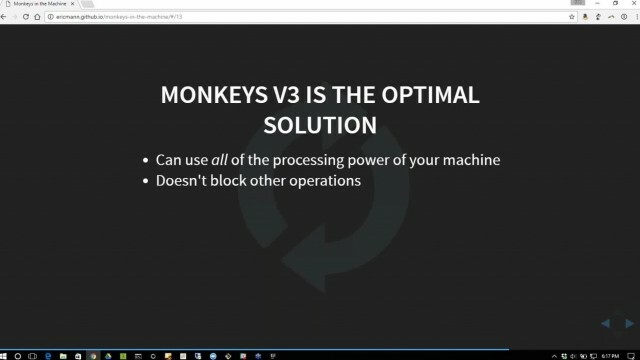 Together, with this more advanced _asynchronous_ PHP we will attempt to breed virtual monkeys and finally solve the [Infinite Monkey Problem]! Eric is a Tekton working with [Tozny] helping to engineer better, safer, more secure ways to identify yourself and control your information.